The singing competition revealed its top 10 singers this week, whittling the contestants down from 14. That means four singers had to say goodbye, and while they're sad of course, it's still pretty impressive that they made it to the top 14. "It's so crazy to even be in the top 14 with the thousands of people that have auditioned, and the fact that we made it this far is just incredible," Ashley Hess told E! News after Monday's show. "It's incredible to be here. I never thought I'd make it this far," Riley Thompson said. 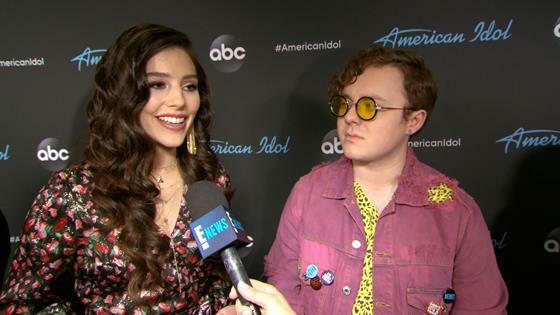 "So to be in the top 14 on American Idol...like you see it on TV, but you never think that you'd actually be here, so my dreams honestly came true." Evelyn Cormier and Eddie Island were also eliminated, and they're feeling pretty much the same way. "We're relieved, we're sad, it's all in one," Eddie said. "But like, we're just so proud that we made it this far, honestly. I think just having the ball kind of drop and you stop and you kind of say wait a second, OK, we were top 14, this is crazy." As for the 10 who did make it, seven were voted through by America, while the final three spots were decided by each of the judges. There was a particularly emotional moment during the episode when Uche delivered one hell of a performance of Rihanna's "Diamonds" after he learned he hadn't been voted through, and instead of offering his critique from the judge's table, Lionel Richie joined him on stage and walked him over to join the rest of the top 10. "I wasn't thinking anything," Uche said of Lionel's move. "I thought he was just coming to give me a hug, because I really needed a hug. Like I was not OK, and I'm still not OK, but we love to pretend like, 'and smile big.'" Uche was joined by Dimitrius Graham and Alyssa Raghu as the judges' saves.